Would you like to give your office a facelift? Glass partitions can make all the difference. Rising in popularity, they bring a polished look to the workplace. Here are four ways your firm will benefit by installing glass walls. This sleek decor shows your business is modern and progressive. In lobbies, gleaming glass looks elegant and sophisticated. Office workstations enclosed by glass suggest honesty as well. Clients will get a sense that your company is forthright by signifying that management has nothing to hide. Still, you can ensure privacy with glass that’s patterned, tinted, frosted, or otherwise textured. Solid panels provide subtle camouflage. With all these options, you can customize glass for your private offices and conference rooms. Glass walls lower energy and construction bills. By maximizing natural light, glass walls reduce the need for artificial lighting. You’ll likely see this benefit in lower electric bills. By increasing energy efficiency, your business reduces its carbon footprint. Creating rooms with glass partitions can be less costly than building traditional walls. Should you wish to change the office layout, many times the glass walls can be dismantled and reassembled. This flexibility also makes moving your company easier since you can take the partitions with you. You can further reduce remodeling costs with our remanufactured workstations. Every recycled component is backed by a lifetime warranty. Moreover, the furnishings bear no trace of former use. Yet, they cost 50 percent less than a comparable new product! Glass walls improve staff productivity and morale. Aren’t you’re more energized when working in a space that’s bright versus dim? Light is vitalizing! Likewise, your teams will be primed for greater efficiency. Glass office walls foster communication since employees can easily see each other. For executives in private offices, glass walls beam a welcoming smile. Additionally, our glass is acoustically sound. With the absence of distracting noise, employees can keep their focus and phone conversations remain confidential. In a tranquil atmosphere, creativity flourishes. Glass-walled conference rooms are unified with the rest of your office too, rather than looking secretive. Glass can also supplement the partitions in panel based workstations. Replacing modular portions with glass makes cubicles look brand new! The attractive atmosphere will fuel staff motivation. Glass walls are durable and complementary. Glass looks pristine for much longer than traditional materials. As with all our high-quality products, these fixtures are built for longevity. 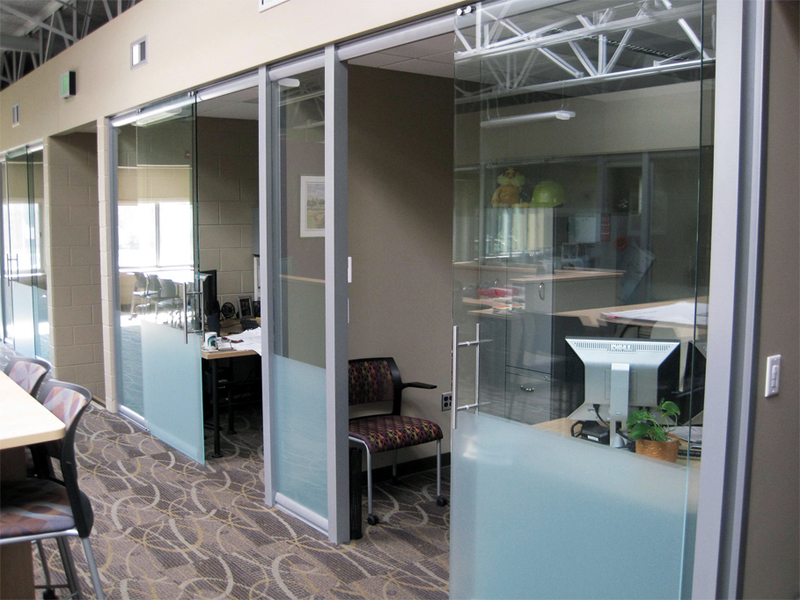 Glass walls integrate beautifully with commercial office furniture, whether made of vinyl, fabric, metal, or wood. Give your building a stylish makeover with architectural glass walls. Your office will look professional, modern, spacious, and bright; an overall welcoming place to work. Just imagine the smiles on your clients and staff!